This special scrapbook tin and card are the perfect way to keep photos of those you love and cherish. The tin takes up only a small amount of space, but can hold a lot of special memories. There are eight double sides pages inside as well as eight note cards in the pocket of each page. Add a photo and a note about the photo and keep it all in this special little tin. It can even double as a gift card holder for eight gift cards! 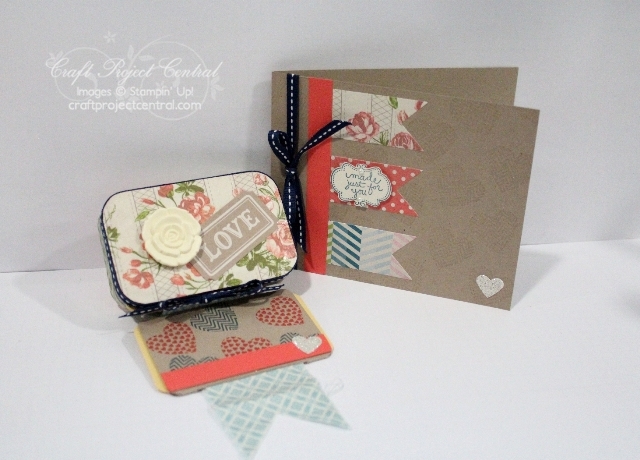 The matching card makes this a perfect gift to give for any occasion! This project was created by yours truly! If you would like to subscribe to the January edition of Craft Project Central and get 10 fabulous tutorials for just $10, then click HERE. But, wait! I'm not done! If you would like a chance to win a Free January subscription to Craft Project Central, then just leave a comment on this post and I will draw a winner Friday, January 11th!